The Aruba AP-121 has been discontinued. No direct replacement is available. The Aruba AP-121 is an indoor 802.11n access point designed for maximum deployment flexibility in low-density environments that require above-ceiling or enclosure-based installations. 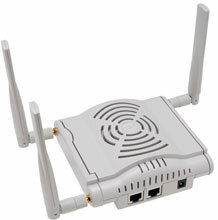 This high-speed access point delivers wire-like performance at data rates up to 300 Mbps. The AP-121 features a single 3x3 MIMO dual-band 2.4-GHz/5-GHz radio with integrated antenna interfaces, is built to provide years of trouble-free operation and is backed by a limited lifetime warranty.